ScanBizCards Business Card Reader is the favorite business card reader with reviewers because it doesn’t just scan and add contacts to the address book (and does it better than other apps) – but also goes much beyond, offering 17 premium features not included in ANY other business card scanner. ScanBizCards is the only scanning app relevant to the iPad and the only app with real-time backup to the web and web-based access to your cards. 2. WorldCard Mobile – business card reader & business card scanner By Penpower Technology Ltd.
Pay Once and Say Goodbye to business card black hole. Using CamCard Lite to evaluate recognition performance before purchasing full version. Never lose a contact again with the Shoeboxed Business Card Reader and Business Card Scanner! 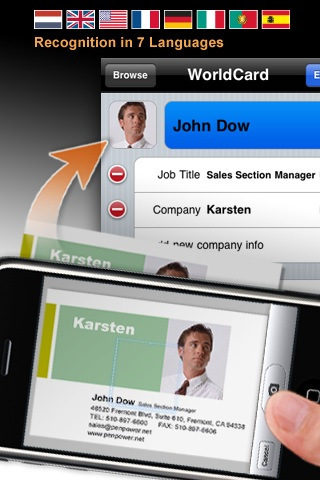 Digitize business cards and auto-share your contact information with your new contacts. Simply snap pictures of business cards with your iPhone and Shoeboxed does the rest. Important contact details are extracted with OCR and human-verified for accuracy.